The earth-shattering Season 4 finale of ‘Orange is the new Black’ left us with little room to think (or feel) about anything else. So it’s taken some time to be able to reflect back on other revealing backstories of the inmates at Litchfield’s prison. There will not be any spoilers here about the finale (c’mon guys, catch up, season 5 is here already! ), but instead we’re time travelling back to episode 7 ‘It Sounded Nicer in my Head’ of which there will be lots of spoilers. As a mental health practitioner, I’ve been looking for discussions about this episode, and I’ve been a little disappointed in the thinness of descriptions of ‘mental illness’. The backstory is indeed of how Lolly was failed by society, but in a completely different way than you may have previously considered. Lolly’s story highlights an invisible part of ‘mental illness’ that has nothing to do with her actual neurology and everything to do with who is given worth and value and who is not. Who we are locking away, why we are locking them away, and how we are rendering people as inhuman to be able to do so. Her backstory shows us not so much the inner struggle of managing Paranoid Schizophrenia- because actually she does that just fine- but instead how she is viewed and criminalised by a society for not ‘norming and performing’ in acceptable ways. The beginning of the episode shows Lolly as a burgeoning young journalist just beginning to hear voices. I have noticed this part of the narrative described in forums along these lines: ‘a promising young journalist whose career was taken away be mental illness’. Was Lolly’s career robbed by mental illness? Or by a society unable to make room for someone who thinks differently, who experiences certain challenges in expressing herself or even knowing what is ‘real’ and what is not. We live in a society that completely fails to note any markers of success that don’t conform to a limited capitalist notion of what ‘success’ looks like. It’s worth noting that prior to the Industrial Revolution, 80% of folks lived in villages- and globally many still do now. I don’t wish to romanticise a bygone era, but the idea that you are only useful so long as you can work and perform in a particular way was born with that Revolution. You must produce. Village life was characterised more by a kind of crude acceptance that each person simply existed. The biggest losers of the Industrial Revolution were not only those who couldn’t perform ‘tasks’ but were also specialists and creatives who could not compete with mass production. They were punished, locked up, murdered, taken away from their families, or put to work against their will no matter how dangerous or inappropriate. Some of those people were no doubt simply ‘unusual’ or were actively working against the machine. These days I wonder if we do much better. Meanwhile we allow so many real criminals to run around freely creating endless cycles of poverty, injustice and trauma in the name of Big Money and Power. Then we wonder why, when ‘success’ was invented by parties most interested in making money off the backs of cheap hard labour, slavery and the working class, we struggle to find happiness when the limitations are so very many? The fact that we’ve been sold this idea (along with everything else) and that we now self-police it is worth examining through stories like Lolly’s. 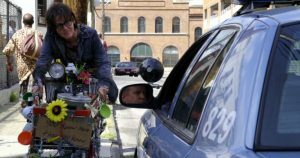 Before we meet Lolly in Litchfield prison, we discover that after her journalist career path ends, she is living as a ‘homeless person’ in Seattle in a kind of shanty town: an area eventually doomed to be bought by developers. Interestingly, despite these limitations and a lack of choices, it then looks like Lolly finds a way to be happy. Not ‘barely managing to hold it together’, but actually happy. Try to look at her life at that stage through eyes that are not filled with judgement by a society that stigmatises mental illness. Think about who loses the most when people step out of society, not in a way that is violent or harmful, but simple ‘outside’. It isn’t Lolly and her ilk. It’s the people who want to throw up more and more cheap apartments and make a fortune from them. Just watch Lolly in the scene. Lolly is living in the ways that make her stronger and that correlate with her values. She’s off the grid. She has an income. She trundles around with her personality and her character well out in front and flowing from her trolley: the sunflowers and the friendly sign, a kind word for all the friends and strangers she passes and sells coffee too (including a representative of the law), and non-judgemental compassion for those worse off. She’s a good person, just like she says. And here’s the amazing part: she has found a Lolly-centred way to manage the voices that trouble her. That stick with the bottle tops stuck on it? Every time the voices start up- and she’s obviously figured out which ones are real and which ones aren’t and which ones she likes and which ones she doesn’t- she shakes the stick around her head and they shut the hell up. Everything about Lolly at this point in the story is successful, it’s a positive outcome for someone who has to live in a society that doesn’t allow for difference. The word success first appeared around the 1530’s to simply mean ‘result, outcome’. It’s hard not to think of the word standing alone with any modern meanings you could attach to it, but if there is such a thing then Lolly is doing it. The real tragedy therefore of Lolly’s backstory isn’t that Lolly was a promising journalist until her future was stolen by mental illness. It is that in order to live in this world in Lolly-centred Lolly-value ways, she has to be an unperson. If you know someone or you yourself have been ‘treated’ in an acute psychiatric unit you’ll know that it’s generally fairly punishing. The object is conformity, not personal relief from the pain or confusion. Functionality within what’s expected of you as a member of society, not curiosity about your journey and help to make the world an easier place to navigate. It can be extremely traumatising. And trauma on top of a bunch of voices in your head is pretty unbearable I’d imagine. Makes you wonder if we create criminals. Was the Lolly we knew in jail: the one who kills a violent attacker without seeming too troubled- only to then be plagued by the memory- created by a system that punishes nonconformists, refuses to offer genuine help to complicated people, and doesn’t respond to her actual needs as a human being? In an ideal world you shouldn’t have to be an unperson to simply exist and be cared for according to basic human needs. Is there really something so wrong with living as closely to person-centred ideals and values within a limited system? When did we start viewing everyone who isn’t a “success” as a tragic problem to be hidden away, as though they have nothing to offer or teach or even as if they do not have a right to simply be? To get help in a way that doesn’t equal having to give you up entirely? 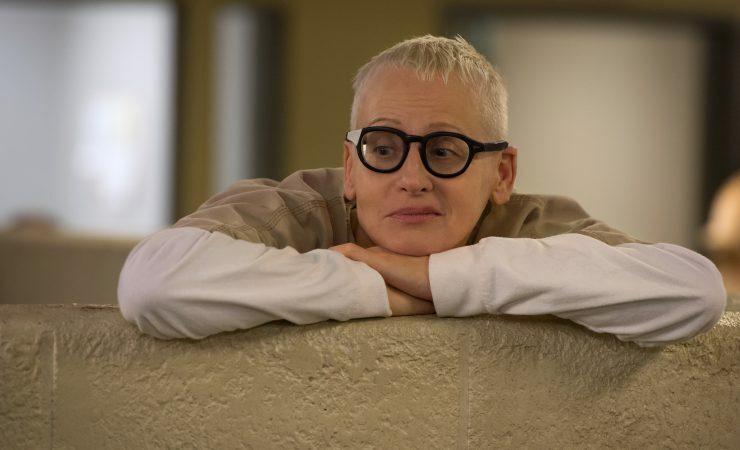 What if we could all live like Lolly? Or we made room for Lolly’s as well as all of our own quirks and issues and voices and histories and problems and tragedies? 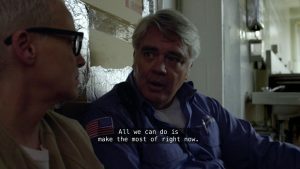 Towards the end of the episode we know that Lolly has been collecting bits of metal, foil and cardboard to make her own time machine in Litchfield prison. To the ongoing credit of Orange Is The New Black, the whole time machine experience is incredibly multi-storied. On the one hand, it’s a bit of a joke: ‘Lolly is crazy and thinks she’s building a real time machine with potatoes and foil’. But on the other hand, the show then uses the Time machine almost as if it is an actual time machine for several of the characters: think of Poussey and Soso. Suspended in time. It’s not a pitiful pathetic act of a crazy person. As she talks about all the things they do say, we see Healy’s face slowly change. He’s looking distant, and we know he’s really not here in this immediate moment, but somewhere else, lingering in the past. Lolly leans in closely and her eyes widen. but his eyes glaze over as he reflects on his own heart-wrenching story about cardboard boxes of childhood, and his whole being changes in front of us. He becomes the child who was so confused by his mother’s struggles, viscerally remembering a past life of creating and hiding in forts. Lolly gently tells him ‘you can stay in here as long as you want’. Healy says with his head down ‘maybe a few more minutes… Then we’ll go’. We know, we feel deeply, that he really did time travel. He went somewhere that he could only go when he allowed himself to stop performing, where he just was, and that place was so incredibly beautifully truly human we almost forget how terrible he is and how shocked we should be at the world these people are forced to occupy. Being in Lolly’s world and understanding, even just for a moment, that ‘time’ isn’t really what we think, is an exceptional way to spend a moment. It’s not a matter of marking the days and ticking boxes on the to-do list. Some moments in time are worth more than others, and knowing who you are, even if it is in deep sadness, is time worth spending, time to be cherished. Lolly shows us the vitality of escape and how to bear witness to each other and ourselves in times of great strain. She sees Healy how she wants to be seen: as a person in need and deserving of kindness and love. And so as Lolly wipes a tear from her eye in compassion for Healy despite all his flaws, I salute her for an invaluable lesson in How to be a Person, and bringing to light just how wrong this society gets that message so very, very often. If you hear voices or know someone who does, the Hearing Voices Network is an excellent resource. Many many many people hear voices or have visions at some stage over their lifetime due to any number of circumstances. De-stigmatising and educating ourselves is the first stage of changing how we approach mental health and create a safer and fairer society. Did you enjoy this post? Sign up to get more like it directly in your inbox on a variety of justice-drenched thoughts and feels around mental health and get FREE journal prompts and an invite to join a women’s group on Facebook to chat about them. If you’re looking for a counsellor who incorporates social justice into her work, then reach out to me directly. I’d love to hear from you and am taking referrals.